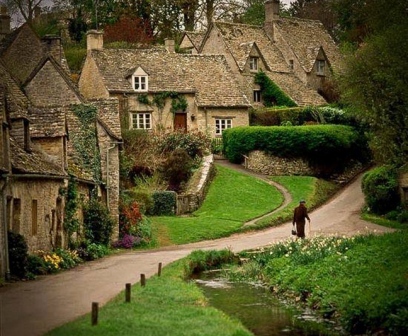 In England in the Cotswold area (Cotswold) near the town of Cirencester (Cirensester) is a wonderful village called Biburi (Bibury). Cotswold - a buffer zone, which is preserved in its original form. Village Biburi seems some are not real, and even fabulous. As if time has stopped here another 400 years ago. A cozy little house, clean tidy streets, overgrown grassy hills, ancient churches - all of this classic English village, untouched by modern architecture. Compared with Biburi may, perhaps, the same lovely English village of Castle Combe (Castle Combe). In the XII century the capital of the Cotswolds it becomes Biburi. And in the XIV century there was a terrible misfortune dervne. More than half of the residents Biburi died as a consequence of the plague. The main streets of the village is considered to Arlington Row - the most beautiful street in England. Once in the XIV century there were built warehouses for wool. And in the XVII century, these warehouses were rebuilt in the houses for the factory workers Arlington. The street leads to a small river called Colne, which divides Biburi half. The two banks are connected by a wooden bridge neat. Virtually all the buildings in the village are made of limestone - oolite. This building material for a hundred years from quarries in the territory of the Cotswolds. Oolite has a granular structure and quality of the material is very soft, so it can not withstand mechanical impact and cut by hand. In the village there is no building that would be built of brick. Now this stone is very expensive. Local craftsmen can build of limestone everything: houses, fences, farms and churches. In Biburi is a beautiful St. Mary's Church, built in the Saxon style. It is decorated with beautiful stained glass windows. Near the village is a fish farm, which is a local landmark. It was founded in 1902. Every year there are about six million are grown trout eggs and release into water England. Near the Arlington Mill is an island called the island hangers (Eng. Rack Isle). Sometime in Biburi local population engaged in the manufacture of woolen products. Wool weavers washed in the river, and then dried it on special hangers. Hence the name of the island. Biburi annually attracts thousands of tourists. From all parts of the world, people come here to feel the spirit of England and enjoy the stunning nature.